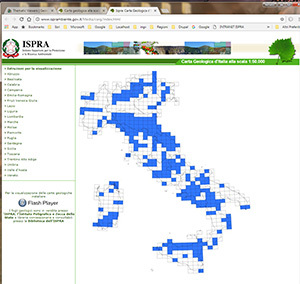 ISPRA is realizing the geological map of Italy at a scale of 1:50,000 (CARG Project). It is working independently or through agreements with regions, autonomous provinces, universities and research institutes. It will cover the whole national territory with a total of 652 sheets. 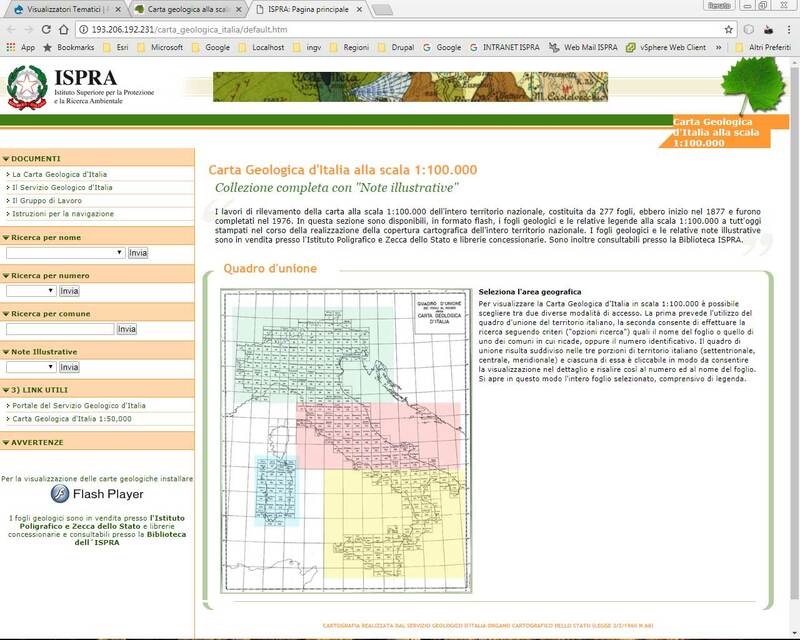 In this section, which is regularly updated, users can view (in flash format) the printed version of geological sheets as well as the ones in progress, for which the survey stage has been completed. Of the geological sheets in progress, for the moment only those that were already mapped at a scale of 1:50,000 and a first part of those that were mapped at a scale of 1:25.000 can be viewed. The survey works to produce the 1:100.000 scale map of the whole national territory, constituted by 277 sheets, began in 1877 and were completed in 1976. The geological sheets at 1:100.000 scale - currently still being printed following the realisation of the cartographic covering of the whole national territory - and the relative legend are available in this section, in flash format. As part of the CARG project and in accordance with Law 183/89, and also considering the importance of the geological knowledge of the deeper structures through the identification, study and the representation of the Italian continental platform and of the main geological structures of seabeds, the Geological Survey of Italy has launched a project of marine geological mapping of the Adriatic sea, at the scale 1:250,000, in collaboration with the Institute of Marine Geology CNR-ISMAR of Bologna. 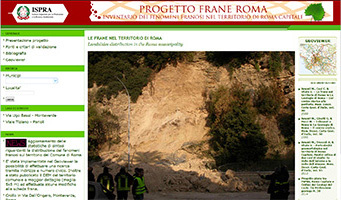 The first systematic data collection about landslides in the terriory of Rome municipalità started in the ‘90s through a contribute to the Volume 50 of Memorie Descrittive della Carta Geologica d’Italia, a monography focused on the geology of Rome historical center. In this volum, the Geological Survey of Italy has contributed with papers on landslides and underground cavities with the perimeter of Aurelian Walls (Amanti et alii, 1995). Successively, data collection has been extended to a greater area, affecting the entire territory of the municipality including Fiumicino. These additional results are included in the chapter Le frane nel territorio di Roma” in the Volume 80 of the same editorial series (Amanti et alii, 2008). 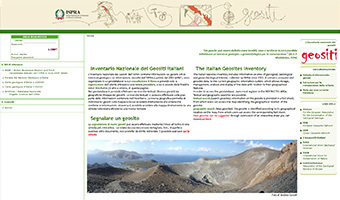 The ISPRA National inventory of geosites contains information about geosites, i.e. sites of geological interest. Data collection started in 2002 (APAT) and the information are stored in a free accessibile geodatabase, that requests only a user registration. 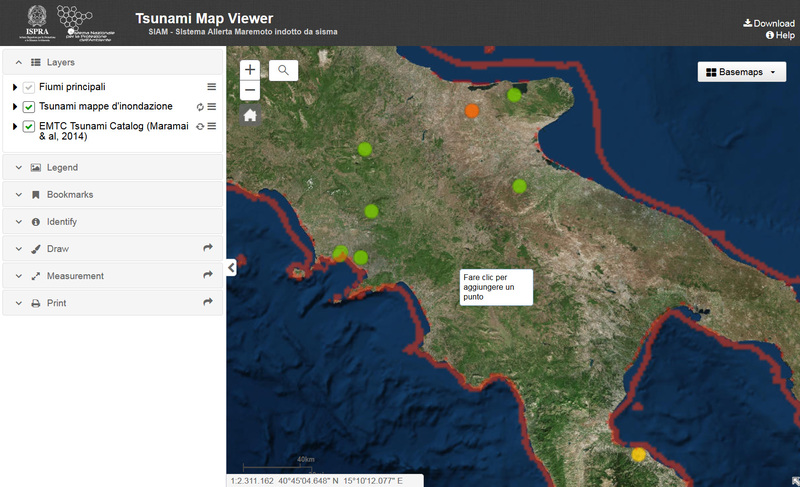 In the geodatabase is possible to make textual queries (Ricerca geositi) as well geographic queries (Mappa dei geositi). Textual searches concern most of the information cointained in the inventory. The geographic search allows to identify geosites on a map and to directly access to the Form containing textual information. Viceversa, it is possible to directly access to the map from a specific Form selected after a textual search. 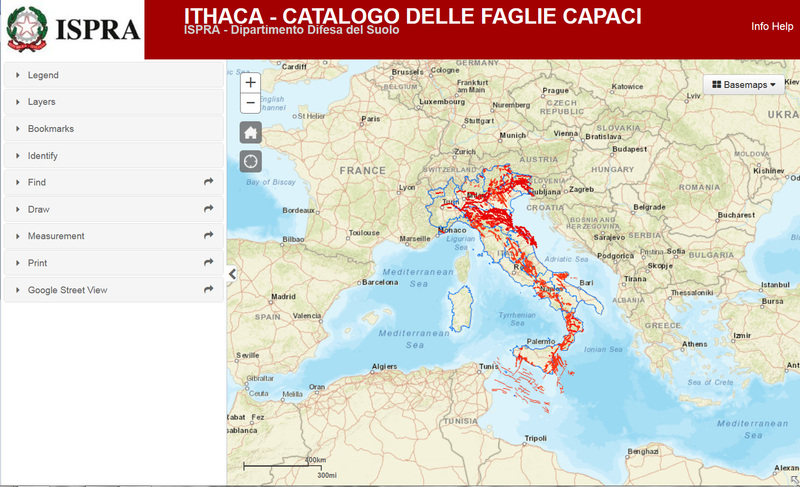 The ITHACA Catalogue provides a first indication about the presence of active/capable faults in a specific area of the Italian territory. Nevertheless, it does not provide a detailed characterization of surface faulting hazard. This is particularly important for microzonation studies. Furthermore, eve inf capable faults may be seismogenic structures, the ITHACA Catalogue cannot used to characterize a seismogenic source in terms of seismic shaking. 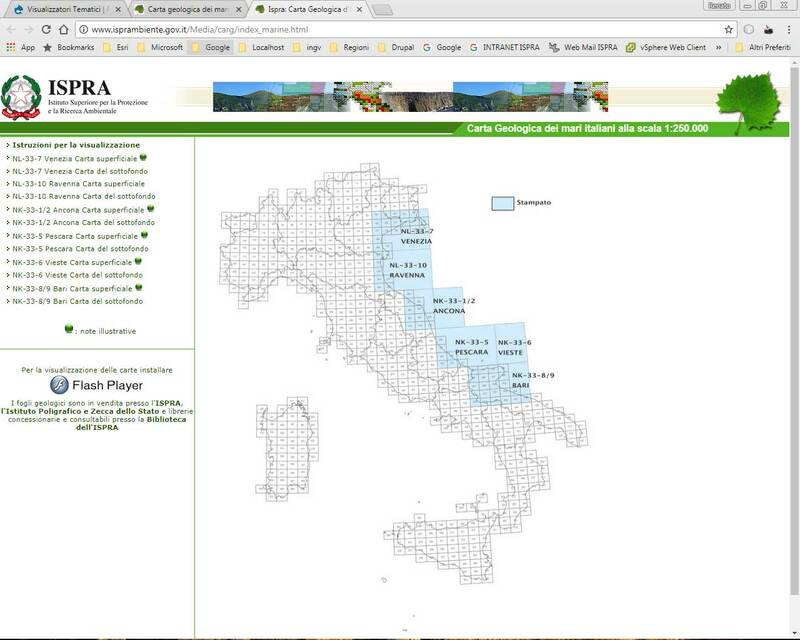 For these purposes, it is recommended to consult other databases (in particular the Database of Individual Seismogenic Sources – DISS).The Geological Survey of Italy provides technical support to local authorities with the aim to improve the knowledge about capable faults in their territory. The Geological Survey of Italy is conducting specific research on sinkhoels (e.g. natural lowering phenomena) that have affected the Italian territory. Through a very detailed bibliographic research a first collection of information about sinkholes was performed. Specific site surveys on the identified cavities have allowed to reconstruct their morphology, structural hydrogeological setting. 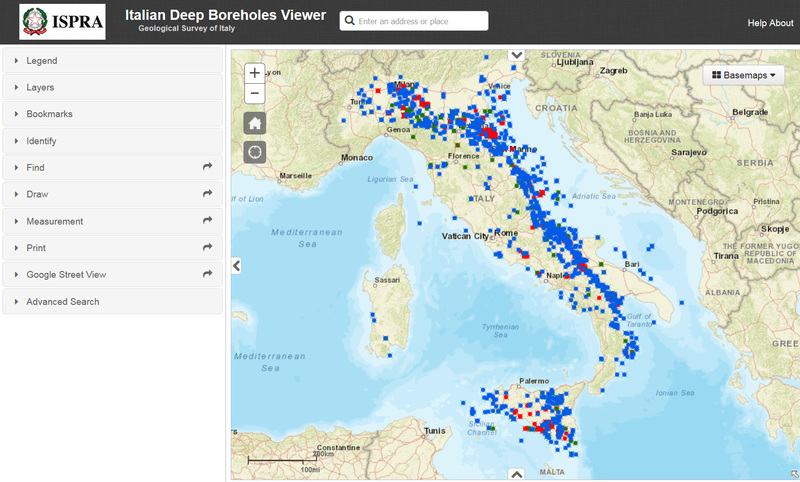 To date , the debate on the definition of genetic mechanisms is still open: for this reason, the Geological Survey of Italy is developing guidelines with the aim to develop a more appropriate classification of sinkholes. In the frame of institutional tasks of data collection and dissemination, the Geological Survey of Italy is implementino an experimental project aiming at developing modern techniques of 3D modeling and visualization. In order to evaluate the potential use of digital data collected in the frame of the CARG National project of geological mapping and other databases, specific tests have been performer on sample areas. These areas have been selected in terms of type of available data, presence of geological structures, areal extension, and detail of reconstructed structures. 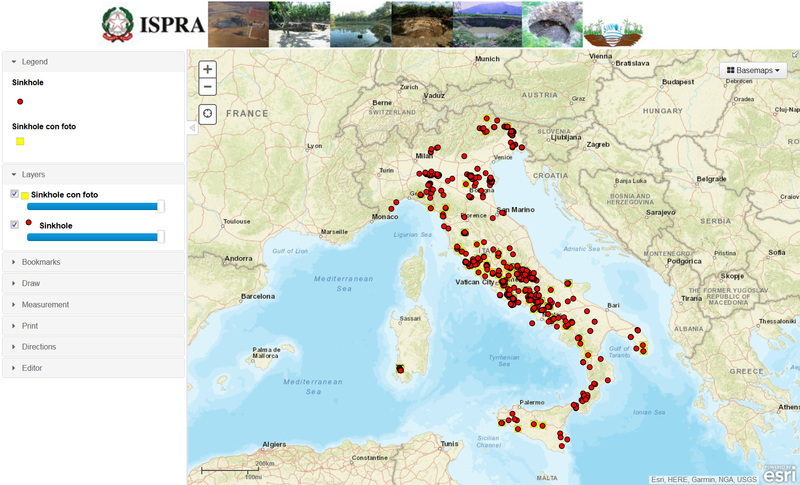 Since 2000, the Italian Ministry for the Environment (MATTM) entrusted ISPRA the task of monitoring the programmes of emergency measures to reduce hydogeological risk, according to DL 180/98 ("Sarno Decree"). 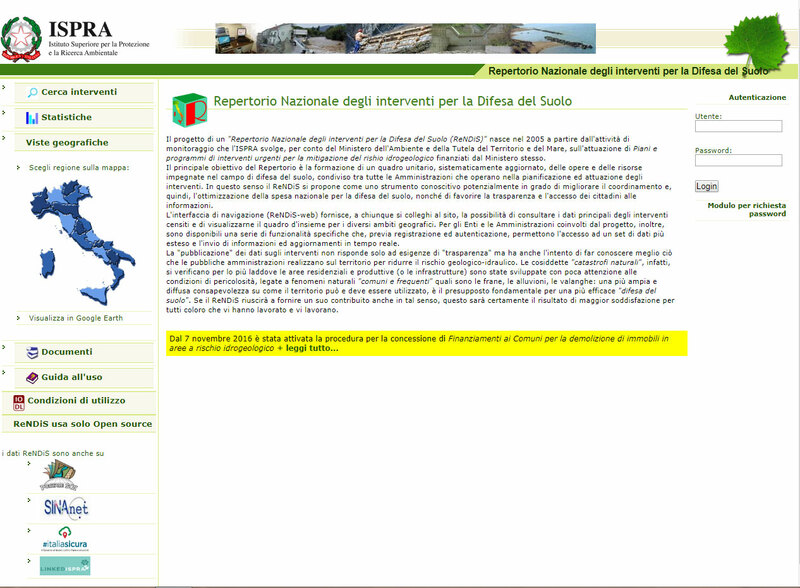 ISPRA is part of the Operational Committee of the Civil Protection Department (DPC). Since the first main shock of the 2016 earthquake sequence affecting Central Italy (24 August), ISPRA has participated to the activities of this Committee, in Roma and then in Rieti, at the Permanent Operative Committee established at Di.Coma.C. (Direzione Comando e Controllo) of DPC. Specific surveys were conducted on about 400 sites located in the territory of 70 municipalities, with problems of viability and to evaluate the geo-hydrologic idoneity of sites destinated at new temporary civil buildings, such as MAP (Moduli Abitativi Provvisori), SAE (Soluzioni Abitative in Emergenza) and/or schools. Investigations were focused even on landslides, water discharge increase from springs and rivers, as well as on temporary sites for wastes of ruins. Finally, it was verified the accessibility of mountain trails, and the stability of some mountain slopes. Data and information about the exploration and production of hydrocarbons in Italy since 1957, deposited at UNMIG (the National Mineral Office for hydrocarbons and georesources), Ministery of Economic Development. Data are open one year after the owner society has ended its mineral permit. 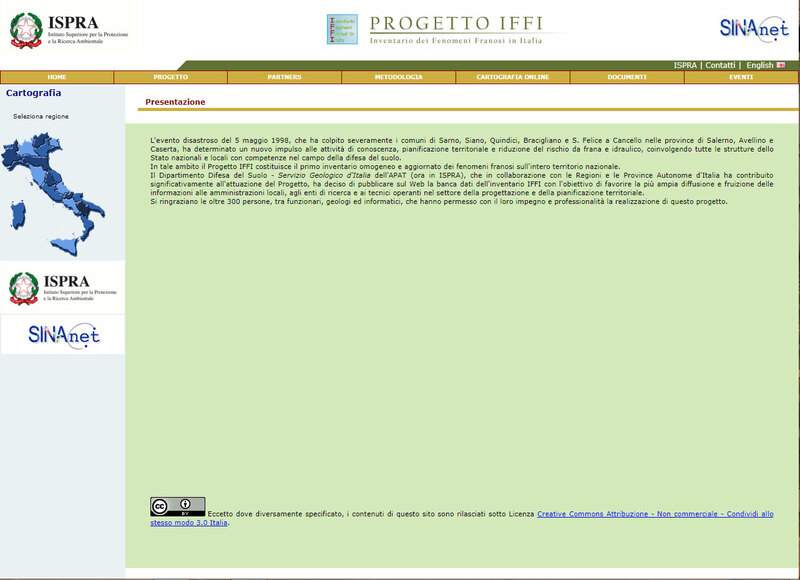 This material has been collected and elaborated in an archive, available at Geological Survey of Italy Departiment. These are boreholes logs in raster format (JPG, TIF, BMP, PDF, etc.) free from restrictions and therefore open accessibile. ISPRA is part of SIAM, System of National Alert established in February 2017. In collaboration with DPC (Civil Protection Department) and INGV (National Institute of Geophysics and Volcanology) inundation maps caused by tsunamis have been elaborated (MIT). These maps are a preliminary tool to quickly identify the coastal areas potentially prone to flooding after the occurrence of an earthquake-induced tsunami. They are designed as “work in progress” and are continuously under revision. Data input (morphologic/bathymetric, trace of coastline, DEM, DTM, air photos, maps, etc.) available at national coverage have some limits due to the scale, methodology and period of data collection, resolution and accessibility. For this reason, it is not possible to guarantee for inundation maps (MIT) the same accuracy and reliability of inundation data provided at a very detailed scale.